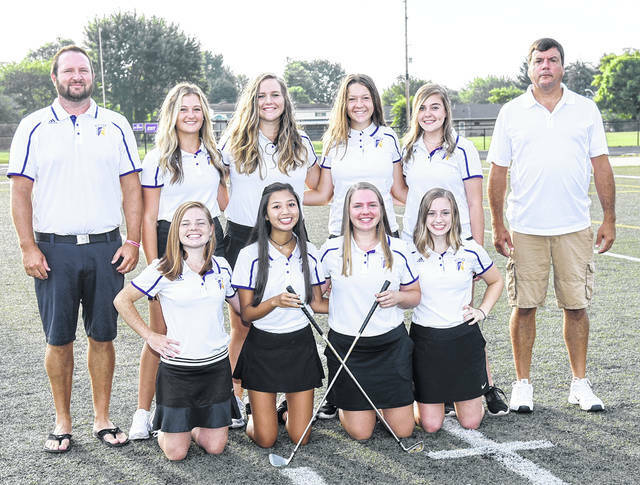 The Butler girls golf team is back row, left to right, Coach Perry, Lexi Crawford, Breanne Kroeker, Mya Williamson, Savanna Dunleavy, Coach Holderman; front row, left to right, Hailee Perry, Alexa Nguyen, Allison Zebney, and Elly Dukes. Hailey Zeller is not pictured. CINCINNATI — The Butler girls golf team, District qualifiers as a team for the first time in nearly a decade, traveled to Glenview Golf Course in Cincinnati on Tuesday to compete in the Southwest District tournament. Glenview, known as one of the toughest courses in the region, lived up to its reputation as the Aviators placed 12th with a 423. Centerville won the tournament with a 314. Lexi Crawford led the Aviators with a 98, Hailee Perry shot 106, Breanne Kroeker had a 107, and Allison Zebney shot a 112.